At The Crosthwait Law Firm we know that an estate plan is not only for you, it’s for you and those you love. You have worked hard to earn all that you have in life and you deserve to have confidence that your assets are properly distributed to your family, your friends and those people and organizations that have been and remain an important part of your life. A proper estate plan is essential for people at all stages of life. Whether you are a senior wanting to ensure that your family has no additional stress at the time of your death, a young parent who wants the peace of mind that your spouse and children will be provided for in the event of your untimely death, or a business owner planning to ensure the continued success of your business after your departure, proper estate planning is essential for the accomplishment of all of these goals. The attorneys and staff at The Crosthwait Law Firm, in Midwest City, understand the importance of an individualized estate plan to ensure that no questions are left regarding how your assets should be divided upon your death. 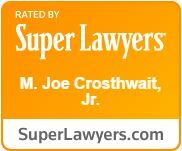 An estate plan prepared by The Crosthwait Law Firm will help to ensure that the financial security of you and your loved ones is adequately protected, and we will work with you to protect your assets from taxation and make sure your property is given to those whom you wish to have it and for the purposes you desire. Additionally, we can assist you in giving part, or all, of your estate to the church, charity, special cause, college or university to which you are loyally committed, if you so desire. A well-tailored estate plan not only protects and distributes your hard-earned assets, it also assists those who are closest to you should you become incapacitated or otherwise unable to make decisions for yourself regarding your health, your finances, or your day-to-day activities. Your estate plan should include either a Last Will and Testament or a Trust, possibly a Transfer on Death Deed, as well as a General Durable Power of Attorney, Medical Durable Power of Attorney (for Health Care), and an Advance Directive or Living Will. The Crosthwait Law Firm provides affordable, knowledgeable representation in the creation of your individualized estate plan, and will advise you in the administration of your estate, potential challenges to wills or trusts and all other issues related to your estate plan. The Crosthwait Law Firm will work with you to ensure all aspects of your estate plan comply with Oklahoma law and are valid and enforceable. The Crosthwait Law Firm offers more than 40 years of legal experience in estate planning, as well as the expertise of a Certified Financial Planner. In partnering with The Crosthwait Law Firm, you can be confident that your loved ones will be provided for as you intended.